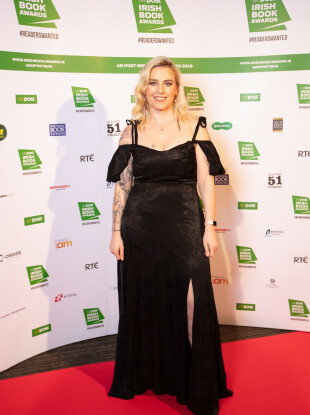 Senator Lynn Ruane pictured at the An Post Irish Book Awards. IT’S THAT TIME of year again – when the best Irish books of the last 12 months are rightfully given their awards. This year’s An Post Irish Book Awards ceremony took place at a backed Clayton Hotel on the Burlington Road, and saw Sally Rooney, Lynn Ruane, Emilie Pine, Emer McLysaght and Sarah Breen and Liz Nugent among the winning authors. Now in its 13th year, the awards ceremony was attended by Ireland’s top writers, publishers, booksellers and media personalities. Maria Dickenson, Chairperson of the An Post Irish Book Awards, said: “This is a really outstanding line-up of winners. It demonstrates the absolute breadth of quality writing we have in Ireland, right across the genre spectrum. It is also great to see so many female writers winning accolades this year. Many of them, including Emilie Pine, Sarah Webb, Lynne Ruane, Cora Staunton and Sally Rooney, are all writing about what it means to be a modern woman in contemporary Ireland and it is striking that these authors used the art of writing to tell their stories in such a truthful and honest way. David McRedmond, CEO at An Post, saluted “all those who encourage new and established writers to persevere in their craft and creativity, enriching our lives and our understanding of each other”. This year, over 100,000 votes were cast by book lovers to select the winners in each category, a 96% increase on the number of votes cast last year. From tomorrow (28 November 2018), the public can vote for their overall An Post Book of the Year by going to the official website. The winner will be announced in January and anyone who votes is in with the chance of winning €100 in National Book Tokens. Previous winners include John Crowley, Donál Ó Drisceoil, Mike Murphy and John Borgonovo for Atlas of the Irish Revolution, Mike Mc Cormack for Solar Bones, Louise O’ Neill for Asking for It, and Belinda McKeon for Solace. This year’s ceremony was presented by Keelin Shanley, while each winning author was interviewed by RTÉ’s Evelyn O’Rourke after they received their award. Full highlights of the An Post Irish Book Awards will be broadcast on RTÉ One at 10.15pm this Thursday, 29 November. Email “Success for Lynn Ruane, Sally Rooney and Aislings everywhere at Irish Book Awards ”. Feedback on “Success for Lynn Ruane, Sally Rooney and Aislings everywhere at Irish Book Awards ”.